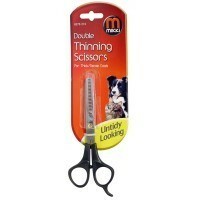 Mikki Double Thinning Scissors are a great choice of product for pet owners looking to keep their pets coat in tip top condition. Designed especially for thick coats, these scissors neatly remove excess hair, leaving a more manageable coat. The heat treated, stainless steel blades are designed to retain their sharp edges with a need for minimal sharpening; a long lasting product designed for continual use. The micro-serrated edges ensure accuracy and minimises slipping, particularly on wet hair, whilst the finger rest makes these scissors comfortable to use and promotes a steady cutting action. Suitable for use on most pets including cats and dogs.